Ever wondered what the Concorde Agreement was all about? It's that illustrious deal drawn up on 19 January 1981 in Maranello by the warring members of FISA and FOCA to decide unanimously on all things that matter in F1. Until the eighties it was common practice in minor F1 countries such as Spain, Sweden, Holland and Japan for local drivers to bring some chauvististic flavour to the grid, joining the regulars for a one-off in their privately entered Marches, Williamses, Tyrrells, or McLarens. Who doesn't remember the likes of Boy Hayje, Torsten Palm or Kazuyoshi Hoshino taking on the regulars in their home Grand Prix? Undoubtedly the ultimate local hero has to be Spaniard Emilio de Villota, who was an avid racer in the British Shellsport series before quitting his day job. From then on he entered most Spanish GPs between 1976 and '82 and became a big force in the short-lived British Aurora AFX championship for F1 cars, winning its final edition in 1980. A gentleman driver par excellence, Villota tried to qualify for a GP on 14 occasions, making the grid only twice. The circumstances in which he was ousted from qualifying for the 1981 Spanish GP were peculiar to say the least. Our editor Felix Muelas clearly remembers what happened (not only for being a former bank manager, incidentally, just as Villota was before Emilio ventured into racing in earnest...) for as a guest of the Jarama technical marshalls our man was on top of the matter all weekend! In fact, the real story has to do with more than just the Concorde Agreement or the confusion surrounding Slim Borgudd's ATS. On the Thursday before the race, Felix recalls, Emilio de Villota knew full well that his entry would be turned down under the new rules. But then you are discounting that in those days Spain's motorsport world was torn apart by two factions. Their war of words had also caused the 1980 Spanish GP to be declared a non-championship event after it was run - no doubt much to the dismay of winner Alan Jones! In the blue corner we had the Spanish motorsport body, the FEA, in the red corner stood the track owner - in this race the RACE (Royal Automobile Club of Spain). In a very Spanish way, neither of the two had complete authority on Spanish GP proceedings. By tradition it was the track owner who would organize the event, collect the fares, pay the prize money, and... accept the entries. The FEA job consisted entirely of filling in a FISA application form. This was also the case with Jarama, a track owned by the members of the RACE. The then vice-president of FISA, Fernando de Baviera (you guessed it, a Spaniard), was also the chairman of the FEA. The power of the RACE had been a source of discomfort for Baviera for a long time and he vowed to Jean-Marie Balestre that he would stamp out its self-guided attitude. He shrewdly ordered the RACE to 'lease' its GP to the official power but Marqués de Cubas (the RACE president, still in office while Baviera is long forgotten) refused to surrender. He suggested that the FEA put its money where its mouth was and go find some other track to host its race on. The problem was: this was 1980 and neither Jerez nor Montmélo were yet on offer as sound alternatives. Anyway, the scenario repeated itself in 1981. 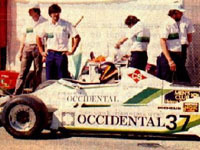 This meant Emilio de Villota was waiting in the wings because the ties between the RACE, Villota and Banco Occidental (which in 1983 resulted in the foundation of the Escuela Pilotos Emilio de Villota at Jarama) were closely knit. Furthermore, with Montjuich being ancient history, the only marshalls Spain could provide were the ones trained at Jarama. As a final insult to the FEA the GP programme was printed with Villota's Occidental Williams on the cover, fresh from its Aurora championship. Villota himself took the task to go to the newspapers and call on every Spanish F1 afficionado to come to Jarama. Why all the fuss? There was a tradition at stake here: at every modern-day Spanish GP Spain had cheered for a local hero - if it wasn't provided with one the crowd simply wouldn't turn up. Who cared if Alex Soler-Roig was an embarrassment or that Emilio Zapico didn't even make the race? They were there and that was the thing that mattered. And now Emilio de Villota, the reigning Aurora F1 champion, would be joining the circus with an all-conquering Williams, no less. He surely would put up a good fight! Now remember this was in a time when FIA had no technical and sporting delegates such as Charlie Whiting or Roland Bruynseraede. The event's marshalls (in this case: those from the RACE) bore final responsibility on all technical and sporting issues. So Felix' friends ignored FISA's claim that Villota wasn't eligible and accepted his entry. To top it all off, the news came in that the ATS was late for Friday practice, leaving the perfect void for Villota and his Williams to step into. So the car was wheeled into the pitlane, closely watched by the head of the marshalling team, a lady called Nana (in the picture behind the car's rear wheels). Then Spanish embarrassment struck again as the Cosworth engine refused to start. Sombre faces all around as the cover came off. The mechanics got to work on the terrible misfire while Emilio had to endure watching the others go out for first practice. In the meantime, the ATS truck and the ABBA drummer appointed to drive the D4 finally arrived in the paddock, with a very angry boss of the Auto Technisches Specialzubehör team, Hans Günther Schmid, shouting all over the place. A few minutes a telex from FISA reached the control tower, declaring Villota's entry 'illegal'. Emilio was suddenly out. To the comfort of the small group of real race fans residing near the country's capital, Gilles Villeneuve turned the race into a thriller.